A 2001, bay gelding by the immortal Hucklebey Berry and out of the GG Jabask daughter MC Jakita, Ames Admiral is a real competitor in the Country English Pleasure division. He started his career in 2005 at the Scottsdale Show where he won the Arabian Country English Pleasure Driving Junior Horse class. Since then, he has racked up even more driving titles. 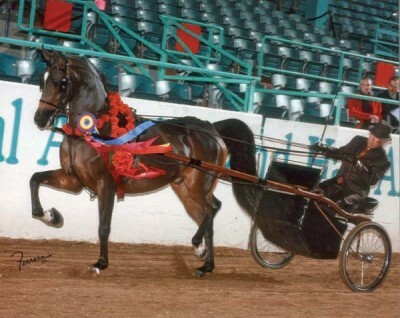 In 2005 Ames Admiral began to be shown under saddle and since then, with driving and under saddle combined, he has earned one U.S. National Championship title, two Canadian National Championship titles, two U.S. National Top Ten titles, and five Canadian National Championship titles. Undeniably, Ames Admiral is a horse that gives it his all when competing in the show ring. In 2010 Ames Admiral was named Top Ten winner in Canadian National Country English Pleasure AAOTR 40 & Over and U.S. National Country English Pleasure AAOTR 36-54 with owner Toni Dolby.